The Sportsman's Alliance of Maine is rescinding its support for Central Maine Power's controversial transmission project proposed for western Maine. This week’s business news brimmed with intrigue as Central Maine Power’s hydropower project was debated before regulators and Bath Iron Works’ largest union may again be wrestling with internal problems. Proponents and opponents of Central Maine Power’s $1 billion hydropower corridor project offered up more details as each side tried to convince regulators Thursday to either grant or reject a certificate of necessity that the utility needs to move forward with the project. 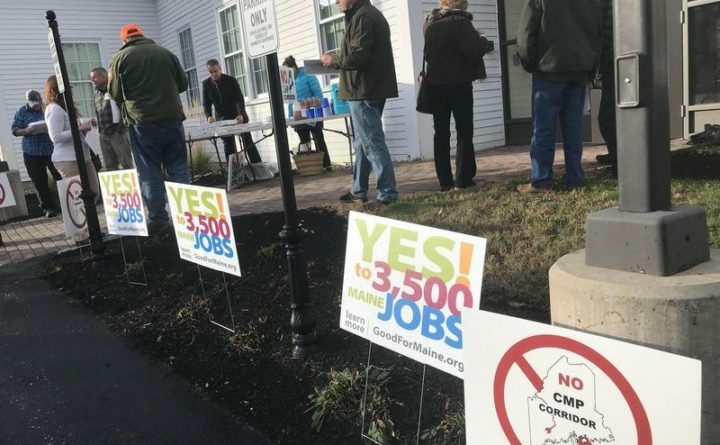 A poll in the related story, What Mainers need to know as regulators dig into CMP hydro deal backed by Mills, found that 73 percent of the 295 respondents did not support CMP’s proposed transmission project to bring hydro power to Massachusetts. Discord among members of Bath Iron Works’ largest union has prompted international union leadership to send a district official to Bath to oversee operations at the local union office. In a poll accompanying the story, 67 percent of the 43 respondents said they belong to a union. But the news wasn’t all bad at Bath Iron Works, which landed an $11 million contract for more destroyer work. Sappi, once synonymous only with large forests and paper mills, during the past 30 years has turned its expertise with wood to the fashion runways and even doctors’ offices. Emera Maine sent a letter to customers Monday saying it plans to ask the Maine Public Utilities Commission to increase its distribution rate, one of the five rates on a customer’s electric bill.